Please Supply a contact telephone number for every order. 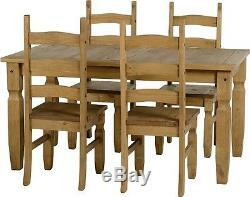 Corona Mexican Style Distressed Pine Dining Room Set 5Ft Table 6 Waxed Chair Solid Rustic. This Beautiful Mexican Styled Corona Premium Rectangular Dining Set comes with a 5ft Dining Table and 4 standard and 2 extra Dining Chairs totalling 6 chairs. It gives a traditional feel to your room with its rectangular table and the beautifully carved pine wood complements beautifully. The Premium Corona range is made from responsibly sourced pine wood which was grown on a timber farm in Southern Brazil. The wood has undergone a treatment process in which it has been sanded, dyed and sealed. The set implements a wax which helps in the reduction of swelling caused by humid environments this also provides an. Extra layer of protection which helps in resisting scratches. 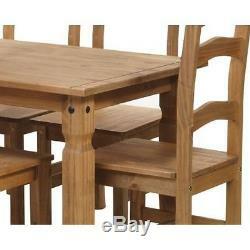 The Corona dining set has been hand finished with lashings of premium wax to ensure that the wood is fully saturated. Note: The buttons on the front of the chair are not always available, please check with with us before placing your order. Table Dimensions (Assembled) : Width: 1520mm x Depth: 920mm x Height: 755mm. Width: 415mm x Depth: 480mm x Height: 1000mm. LARGE QUANTITY MEXICAN PINE HOME FURNITURE IN STOCK. Any questions, do not hesitate to ask. All furniture must be unopened due to health and hygiene laws. WE ARE UNABLE TO ARRANGE REPLACEMENT FOR DAMAGED GOODS THAT HAVE NOT BEEN SIGNED FOR AS DAMAGED. Corona dining set, pine dining table, 5ft pine dining table and chair, 5ft pine dining table and 6 chairs, pine dining room table and chairs, pine dining room chairs, solid pine dining table, antique pine dining table, corona mexican pine dining set, corona furniture, mexican dining set, mexican pine dining table, corona pine furniture, corona pine dining table, extending dining table, dining table and 4 chairs, dining table set, wooden dining set, wooden pine dining set and chairs, dining set and chairs wooden, wooden budget dining set, dining set wooden, wooden dining set and 6 chairs, wooden pine dining set. 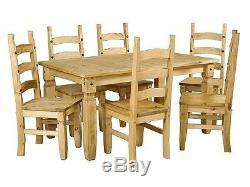 Oak dining table and chairs, 5ft oak dining table and 6 chairs, solid oak dining table, oak dining room table and chairs, rectangular dining table and chair set, pine dining room table. The item "Corona Mexican Dining Table and Chair Set 5ft Wooden Dining Table and 6 Chair" is in sale since Friday, February 24, 2017. 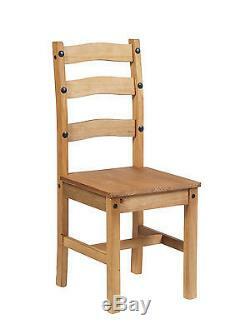 This item is in the category "Home, Furniture & DIY\Furniture\Tables\Kitchen & Dining Tables".store" and is located in Erith. This item can be shipped to United Kingdom.